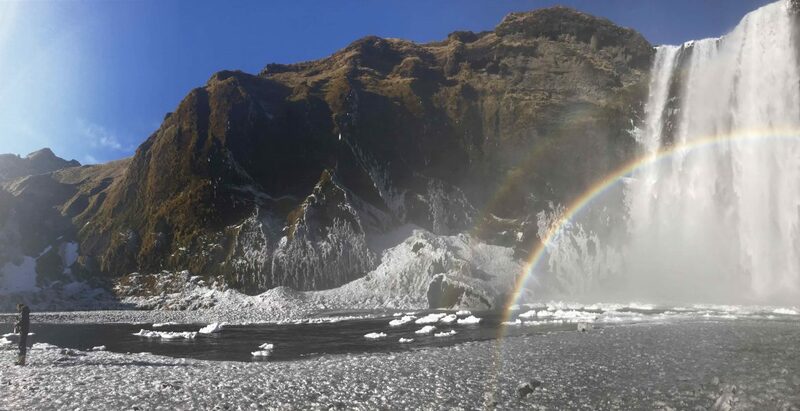 Do I describe how the rainbow-colored mist hit my face, gazing up at Skógafoss? Or dangling my feet over a cliff edge as I listened to the gentle lap of the incoming tide? How about attempting to keep a straight path, driving through 72 mph winds to Jökulsárlón lagoon? Eating fajita seasoning with beans over burnt rice for dinner? Or feeling my stomach drop at the price tag of a full tank of gas? International travel can be daunting and expensive. So when a friend approached me about going to Iceland and said tickets were only $300, I said yes. We could make the rest of it inexpensive, right? But after browsing trip blogs and housing/car rental costs, I began to have misgivings. However, with some planning, it is possible to have a fantastic trip to Iceland on a budget. I am living proof! So here I present a comprehensive, anecdotal budget,from a truly thrifty traveler (I can vouch that everything I’m wearing is from a thrift store, and probably stained). 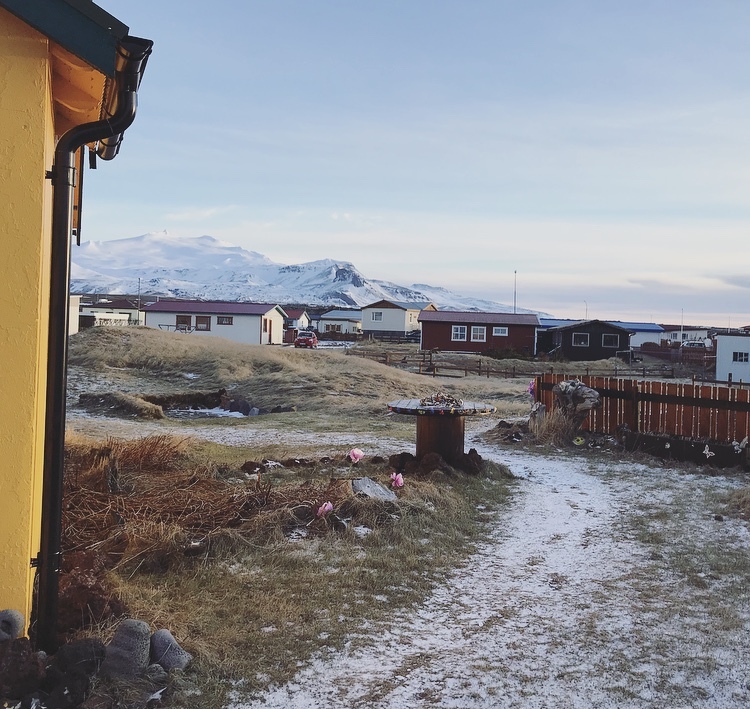 When we opened the door to our “farm” house in Hvolsvöllur, I thought we must have gotten the wrong address. It had impeccable interior design and a fully-stashed kitchen. I felt like a culinary master, preparing my simple oatmeal on the fancy stove. Our host also left us directions for a hike to the beach, which gave us a chance to explore the countryside. On hike from our airbnb to the beach ft. Icelandic beauties. The most unique place we stayed, however, was a cozy, cliff-edge house on the Snæfellsnes Peninsula of western Iceland. It had no Wi-Fi, but was stocked with CDs, novels, and games. The refrigerator was a storybook of past guests’ trips – notes written on coffee filters thanked our host, with tidbits like, “We chose Bob Marley for dinner,” and “Happy Halloween from our 500,000,000,000 ISK bacon breakfast” with a sketch of a smiling pig. We played Icelandic scrabble but encountered a few problematic letters (I’m not sure if “smoræs” normally counts). Since our place was also located on the edge of the volcanic national park, a few of us went for morning and evening walks through the lava fields. Sunset jaunt through town of Hellissandur, on Snæfellsnes Peninsula. Strong winds are part of the daily forecast – in winter, at least. When the rental car guy handed us the keys, he casually cautioned us to hold onto the doors, because if we left them open when we got in or out, a heavy wind could rip them off (and cost us ~€3000 a door). While that casual add-in effectively terrified my friends and I, driving through said winds wasn’t so bad. The roads vary in condition, but generally the main road (Ring Road) around the island was well-maintained. The safe bet is to rent a 4-wheel drive car. It may not be necessary, though, depending on the time of year. Gas is very expensive. Our giant 5-7-seater, which we nicknamed ‘Hank the Tank,’ ate through gas especially quickly. Be prepared to spend $100+ on gas, depending how far you drive. It was hard to stomach that reality on the trip, but every time I thought about the expense I reminded myself that it was just the replacement for a couple of meals eaten out. If you’re driving a rickety old rental car, ignore your instincts – don’t buy cheaper gas. It is bad for the car and will cause it to make suspicious thudding noises (due to particle buildup within the engine, other science, etc.). Eating out is generally very expensive in Iceland. We were nonetheless determined to keep costs low. Our first stop after picking up the rental was a chain grocery store called Bonus. We split up and bought our own breakfast and lunch supplies. Then my friend, who co-planned the trip, and I picked up dinner supplies for the next 3 days. This became our routine. In total, we spent ~$3 a night on dinner. My personal food total for breakfasts and lunches was $30 for the entire trip. Pretty crazy, right? We did this by filling up on backpacker staples: pasta, sauce, beans, wraps, cheese, etc. for dinners. On one grocery trip, I searched for chili seasoning but couldn’t find any and all the veggies were too expensive for our very low budget. So instead, we made what I dubbed “Poor Man’s chili”: 4 cans kidney beans + fajita seasoning + ½ can tomato sauce + canned tomatoes, all over burnt rice. For my own meals, I bought oatmeal, peanut butter, bread, and apples – and also biscuits (cookies), because they’re exquisite and make great driving snacks. View from the highlands on (beginning of) Fimmvorduhals. Skógafoss (waterfall) is where I saw the full rainbow. We also climbed up the stairs next to the waterfall and did a section of the Fimmvorduhals hike. From the highlands, we could see the Skógá river snaking its way lazily down to its tumultuous drop-off. We also had a 360° view of the land: mountains, fields, and ocean. Lying cross-legged, outstretched in the tufty grass, I started tearing up. Why? Partly jetlag, the other part was sheer awe. Reynisfjara (beach) The infamous “Black Sand Beach” is always packed with tourists but is nonetheless worth seeing. The most fun part was going to climb on the boulders across the beach, but if you go around the bend, don’t spend so much time there that you get caught in a higher tide. In this event, you will inevitably end up with soaked hiking boots on the way back. Jökulsárlón (glacial lagoon) Important: Walk around the edge of the lake, don’t just stay in the tourist picture spot. If you go further, you’ll get to see the herd of seals that migrates there from the ocean. My friend and I ran to the edge of the glacier itself, which was incredibly beautiful. On the way back we got to see a huge seal sliding out onto the frozen portion of the lake surface. Kirkjufell (volcano) & Kirkjufellsfoss (waterfall) If you’re on your way to the western peninsula, this is definitely worth seeing. There is no hike, so I wouldn’t spend much time here. We stopped for gas in a nearby fishing town and threw a frisbee around on the beach to take a break from the car. Make sure to check out the barnacle-coated rocks! Hellnar to Arnastapi, Snæfellsjökull National Park It was straight out of a fairytale. Craggy cliffs edged out to the bluest ocean, with glacial mountains in the periphery. I cautiously climbed out to the edge of one of the narrow cliffs. Sitting there, I could see seagulls perched on the sides and swooping out over the ocean. It was my favorite spot of the trip. Þingvellir National Park where you can hike between two continental plates. It also has a fascinating historical background.We took an easy trail over the no-man’s-land field between the plates, and walked to the edge of Þingvallavatn, Iceland’s largest freshwater lake. Even though it looked completely frozen, in the silence you could hear a continuous crackling, sometimes as loud as a gunshot, from the ice beneath the surface. Reykjadalur (hot springs) Natural, FREE hot springs. Getting up to the springs requires a climb, but is definitely worth it. Note: go further along the boardwalk before you get in. It’s warmer further up. We were informed of this after we’d already gotten into the (not-as-warm) water. I spent the next few seconds freezing in the cold wind as I sprinted down the boardwalk to jump into the hotter part. Final note: Don’t get crazy about expenses. My friend and I spent our last full day in Iceland exploring Reykjavik. Like proper stingy tourists, we packed snacks and weren’t planning on spending money. But when I saw a sign advertising “free waffles at the bar,” the gods pulled me in. 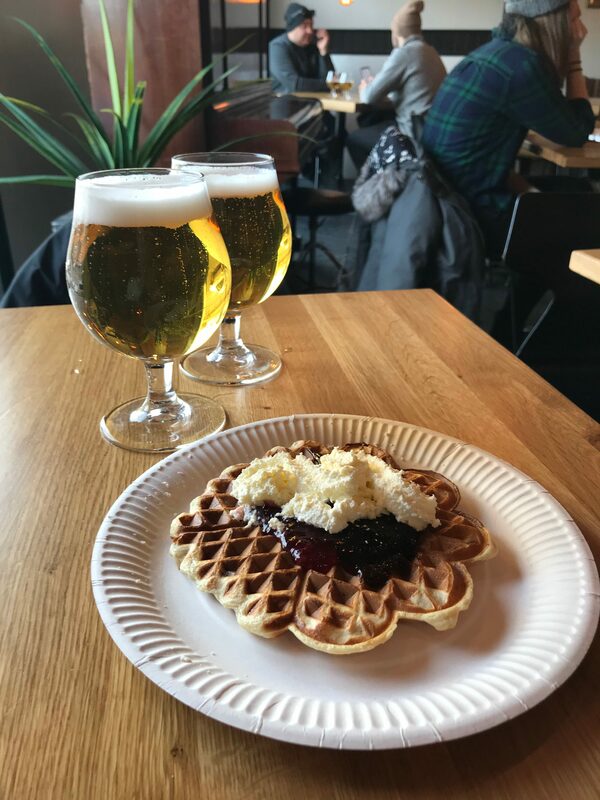 Sitting there with my friend, both of us giddy on waffles and cheap beer, I felt like I could truly unwind from the hustle of the week. This leads me to my last piece of cautionary advice: don’t stress too much over the money. I spent weeks working extra shifts to save for the trip. Because of this, I felt a lot of pressure to avoid unnecessary expenses while I was there. But ultimately, if you can, relax and don’t worry about spending a little on whatever you’ll enjoy. Like two beers in a bar that gives out free waffles. If everyone is willing to live simply – and believe me, after a full day of trekking around Þingvellir, cheesy pasta will sound like the best thing you’ve ever been offered – things will work out. Small backpacking stove for many nights of cooking noodles. A tent, incase even those airbnbs are unaffordable. Camping is great anyways! A travel sized backpack so you don’t have to check any bags and can easily walk around with your luggage. A good pair of shoes for a lot of walking, and so you can always be prepared for an impromptu hike. If you’re doing a bike-packing trip, here’s some starters to make that easier. 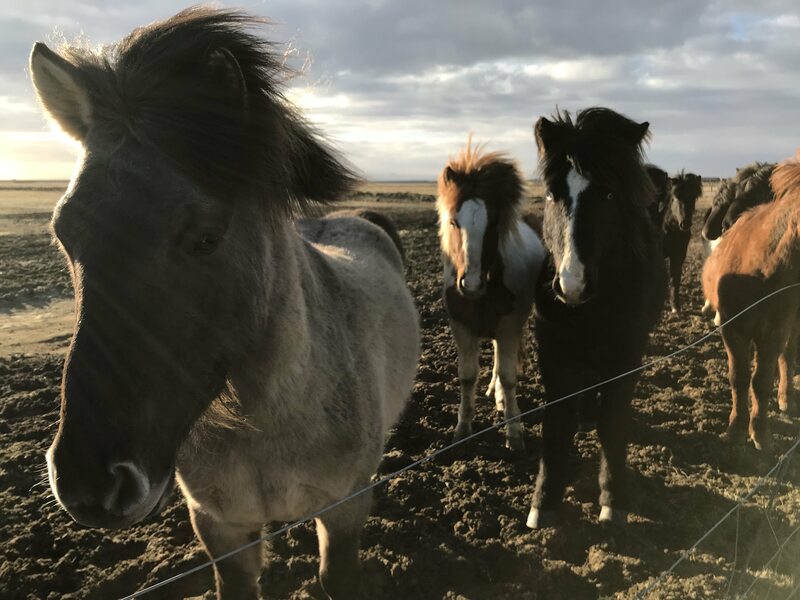 Thanks for the blog, I was planning a travel Iceland and now I know what kind of budget I needed.